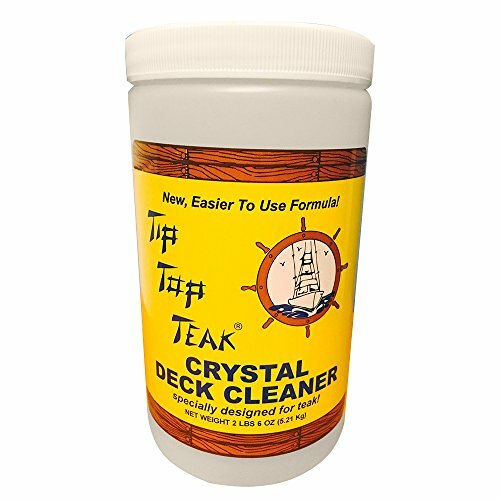 Tip Top Teak's Crystal Deck Cleaner is just what you need to begin the restoration of you ship's teak. Crystal Deck Cleaner is specially designed for those large open areas on your deck that have endured quite a bit of wear and tear. Tip Top Teak's cleaner, brightener, and sealer comprise the components of our three step process designed to clean, restore and protect your valuable teak. For over 30 years Tip Top Products has been producing quality products for the care and protection of your marine craft. Our Tip Top Line has always been known as the choice of yachtsmen and boaters around the world and our Wood-Oil Sealer has been proven time and again to be the premium sealer in the world. We are continuing to strive toward giving our customers the highest quality products at a fair price and are designed to be simply the best. If you have any questions about this product by Sudbury, contact us by completing and submitting the form below. If you are looking for a specif part number, please include it with your message.